An insect sensory bin is a great way to explore and learn about bugs from the comfort of your home. 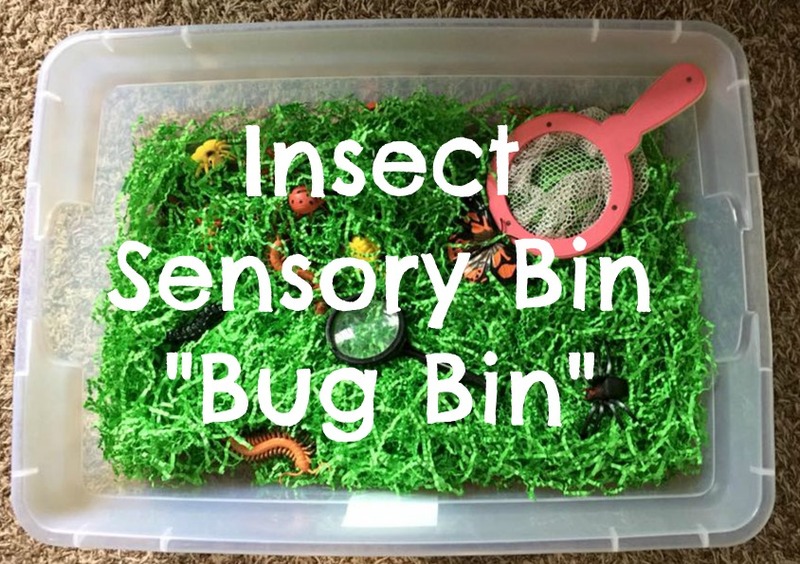 In this simple sensory bin I used green “easter’ grass for the base, then added in plastic insects and some bug hunter tools such as a bug net and magnifying glasses so we could get up close and personal. What a wonderful way to spend the afternoon and such a fun activity! For more Insect and Bug activities check out my Pinterest board. Follow Heather Lawrence’s board Insects & Bugs. Early Childhood activities on Pinterest. « What do you do with an expired car seat? My vet has banned us from using Easter grass because my dog had a major surgery when it got wrapped around his intestines. I love this idea though! I’m going to tweek it to fit our family’s needs! I was a bug fanatic as a kid! I need to go to Walmart and get some plastic buggies and some paper grass if they have some! Great idea!! Thanks! Using easter grass is a great idea to add to a sensory bin! It is such a strange texture and would definitely engage kiddos! That would be a good activity for little kids. Fun and creative. I love making sensory bins. I really like this theme. How cute!! This would be perfect for my little guy he loves to dig through things. I just love this idea for kids. Both mine are a little older now would have loved this when they were preschoolers. I love the idea of a bug sensory bin. This would make perfect sense right now as my 16 month old is into her big brother’s plastic bug collection!! This is a really cool little activity! It’s simple enough to do and it could be a great way to learn about insects and arachnids. My son would love this! He loves to touch and feel his way to learning. Great suggestion! What a great way to help kids learn about bugs without bringing the real ones into your home. I love this idea. This is such a great idea! I don’t think my kids would go outside and look through real grass for bugs, but they’d certainly have fun doing this! Okay, my son would think this is the most coolest thing ever! He is really into bugs and spiders right now (EEK!) so this is right up his alley! This looks so cool! What a great way for kids to be able to learn more about bugs and things like that. This is a neat sensory bin. Sensory learning is so important for children. I love crafty learning ideas like this. I love a good sensory bin and this one is just too cute. This looks like fun! I love how easy it is to put together something like this and make hours of excitement for your kids. Really neat . Looks like fun for young ones. So many kids love to learn about insects and this is a creative way to make it happen. Clever! This looks like a lot of fun! My son is obsessed with his plastic spider and we do have a collection of rubber bugs. What a cute theme. I have done all kinds of sensory bins with my little ones but not a bug one. I will have to try it, my son would love it! Now this is something my kids would like. Great activity! What a great idea! I would love to make one of these up for my littlest. I think he’d get lots of benefits from this! My youngest son has some sensory issues and it just so happens that he LOVES bugs, too. This is perfect for him. This is a great activity! So cute, and I bet kids will absolutely love it!